Peer-to-peer car rental services, like RelayRides, are gaining quite a bit of attention but an attorney specializing in asset protection planning says they can also present a serious risk to your financial well-being. 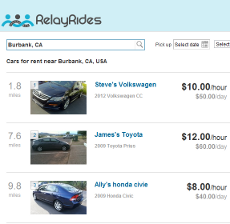 RelayRides went nationwide in March this year after launching in Boston in 2010. Many participants loan their cars as a good deed to open up parking along busy urban streets, promote environmentally sound habits or simply to help those in need of a ride. Most, however, opt to rent their vehicles for a variable rate – usually about $10 per hour. “Every car loaned or rented through the program gets $1 million in liability insurance coverage from RelayRides, but even that may not be enough,” says attorney Hillel L. Presser. Earlier this year, a man who rented a car through the program was killed in an accident while driving the wrong way on a highway, Presser says, citing a New York Times report. Four people in the car he hit were seriously injured. In today’s world, lawyers have gotten very creative in what they’ll go after, which is why comprehensive protection of assets is absolutely crucial, he says. While it's fine to complain about lawyers, the harsh truth is that $1 million is not very much money if one or more victims of an accident are severely injured and face years of costly care and reduced earning capacity. Lawsuits in such cases often produce awards of many millions of dollars. • Account for ALL of your assets: Not sure of what you have? Don’t wait for a plaintiff’s lawyer to tell you exactly what that is before he or she takes it from you. Take stock of valuable domain names, telephone numbers, intellectual property, potential inheritances, and other non-liquid assets. • Liability insurance is no guarantee: Buy as much insurance as you can; it’s cheap and it helps you sleep at night. But realize that 70 percent of claims will not be covered. Your coverage may be inadequate for a particular suit, and your insurance company may go bankrupt. Having insurance and an asset protection plan is the belt-and-suspenders approach for hanging onto your pants. • Convert non-exempt assets into exempt assets: State laws protect some personal assets from lawsuits and creditors. Those assets typically include your primary residence; personal items such as furniture and clothing; pensions and retirement funds; and life insurance. Find out the exemptions for your state and convert non-exempt assets, such as cash, into exempt assets, such as life insurance. • Transfer your assets to a protective entity: The key to asset protection is to own nothing while controlling everything. Transfer any non-exempt assets out of your name to protective entities such as trusts, limited liability companies, limited partnerships and others. • Don’t loan out your car – even to your kid: If your children are going to drive, they should drive cars titled in their name alone. And if they pay for the cars themselves, you add another layer of protection. Courts may find that parents who are obviously paying for their children’s cars liable to some degree, even if the car title is in the child’s name.